Check out our exclusive footage of the Kitchen Hub from NECO EXPO 2018! GE first unveiled the Kitchen Hub prototype at the 2018 Consumer Electronics Show. The Hub was initially going to be released in fall 2018, but it has since been pushed to 2019. It consists of a 27-inch touch screen placed above your range or cooktop where an over the range microwave or ventilation hood would usually go. Don't worry - this appliance has great task lighting plus built-in exhaust hood ventilation to prevent condensation and grease build-up on the hub. A forward-facing HD camera with several angles for Google Duo video chatting and a cooktop-facing HD camera for taking photos of meals in progress and easily sharing to social media - and easily digitizing recipe cards! Pictured below: A demonstration of a recipe walkthrough. It's easy to use and great for people who hate having to constantly stop what they're doing to refer to the recipe, whether it's on their smartphone or on paper. You can quickly skim through the "cards" displayed on the screen or get more assistance with videos and detailed instructions if it's your first time trying the recipe. Based on our experience seeing the Hub at NECO EXPO 2018, the touchscreen setup is intuitive and easy to navigate - an important feature that isn't always at the forefront of new smart innovations! You can also control it with your voice thanks to Google Assistant. GE chose the over the range location because it is central to kitchen activity and is also at an easy viewing height. It will retail at around $1,200, although their initial estimate was around $600 when they first showed the prototype. 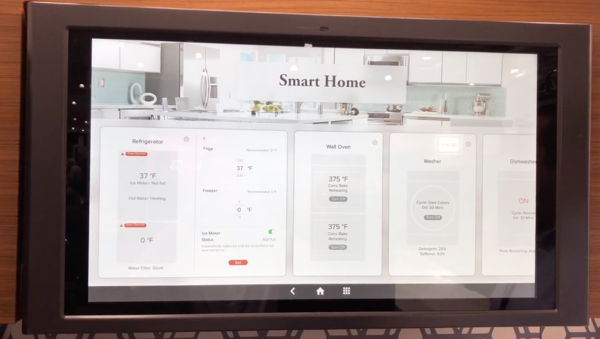 GE Appliances has a few areas where they want to expand the GE Kitchen Hub - for example, they want to integrate it with smart security cameras, so if someone knocks at the door you can see who's there through the Kitchen Hub. They also want to make a microwave version of the Hub to avoid the issue of displacing an OTR microwave. Of course, you could just replace the OTR model with a microwave drawer as another way to save counter space! Chinese manufacturer Haier bought GE Appliances in 2016, and their smart technology has enabled the Kitchen Hub. We're looking forward to seeing where the Haier platform is headed: the Haier U+ Smart Life Platform (now called the GE Appliances U+ Connect platform) might be a solution to the fragmented smart home trend in appliances. Like many other appliance brands, GE used to have an intermediary between you and the smart appliance - in this case, Geneva Home. Manufacturers have really struggled in the area of voice control when it comes to these apps - Samsung's Bixby virtual assistant, for example, has been known to mix up words that have similar pronunciations. 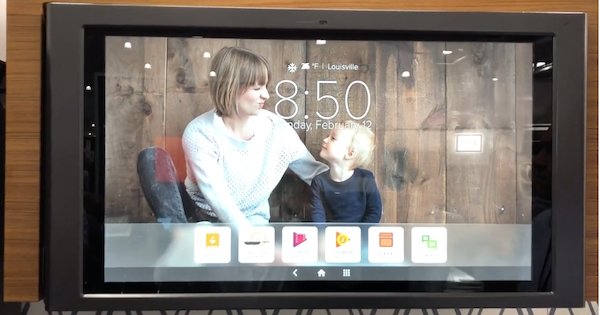 The U+ Connect platform pulls Geneva out of the mix and lets you control your devices from one place rather than across multiple apps. And when it comes to using your voice, now you can say "Hey Google, make ice" instead of "Hey Google, ask Geneva Home to make ice." Pictured below: the Smart Home screen of the Kitchen Hub. It displays the temperatures of the refrigerator and freezer and icemaker status, as well as status on the wall oven's heating progress, the washing machine's cycle and time remaining, and the dishwasher's cycle and time remaining as well. It may seem like a small change, but it means that you won't have to deal with issues like dropped support for older smart appliances or losing interconnectivity if you upgrade to a new model. The U+ Smart Life Platform was released in 2014 around the same time that the Apple HomeKit was, with the goal of helping smart appliances interact more effectively, and even to allow smart appliances from different brands to connect. Keeping an eye on this platform may be a good idea if you're interested in connected home appliances but frustrated by the lack of interconnectivity. Just because GE Appliances wasn't the first on the market with a connected hub system doesn't mean they don't have a lot to offer! We'll compare GE's approach to Whirlpool and Samsung. However, some review organizations are still unimpressed - they find that the system is still unintuitive even in its third version, and find that Bixby is not quite intelligent enough to keep up. Whirlpool connected appliances came out in 2018 and are designed to stand alone or be part of a larger Whirlpool appliance package (plus they're available in new Sunset Bronze, a unique gold-toned color when the industry is mostly focused on stainless steel and black). 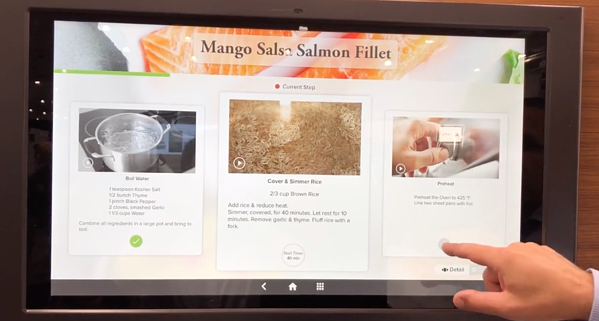 Their touch screens are comparatively small but include kitchen-focused features like integration with the app Yummly for walking you through recipes and streamlining the cooking process. Learn more about Whirlpool connected appliances in our article! Although GE's initial price estimate made the Hub downright affordable smart technology at $600, as they've tweaked and improved the technology the price has basically doubled. So although it is still not quite as big of a risk as investing in an entire refrigerator or kitchen range (that needs to do things like cook and keep your food cold on top of providing the smart appliance experience), the Hub is now as expensive as a higher-end appliance. 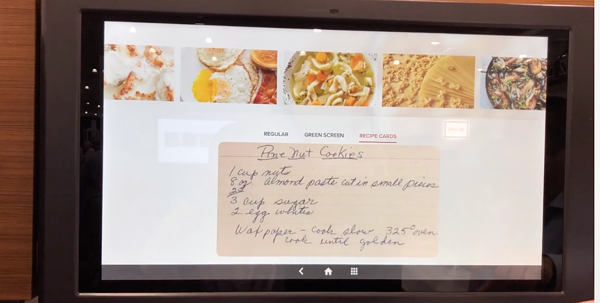 Pictured below: An example of a digitized recipe card taken with the cooktop-facing camera that will be stored in the cloud for easy access whenever you need it. We can't speak to the recipe itself - Pine Nut Cookies - but the technology is solid! Should You Buy the GE Kitchen Hub? The biggest issue with new smart home and smart appliance technologies is... their newness. They are relatively untested on the market and, as a result, we can't predict how well they will perform over time in terms of upgrades, repairs, and integrations with other technologies as they emerge. Even Samsung's Family Hub 3.0 still has some issues, and it's hard to predict how these systems will change over time. That being said, the GE Kitchen Hub may be a more promising technology if you look forward to not being locked into a ton of apps and sub-par virtual assistants. We like that the Kitchen Hub can stand on its own - so if you don't happen to have an entire suite of GE connected appliances already, you can still enjoy what the Kitchen Hub has to offer. The Hub will be available in stainless steel, black stainless steel, and GE Cafe matte black and matte white with no brand badge, so you can mix and match with other brands easily. Another advantage of the Kitchen Hub is that it has pretty basic appliance functions - ventilation and task lighting - and could replace an over-the-range microwave or range hood rather than a larger, more crucial appliance like a range or refrigerator. And depending on the area where you live, technicians with the equipment and training to service new connected appliances may be in limited supply. The GE Appliances product reduces the overall risk you're taking as a consumer since we often depend so heavily on our refrigerators, ranges, and cooktops. ...Then keep an eye out for the Kitchen Hub and check it out in person if you can! We hope this helped you learn more about the Kitchen Hub. We're excited to see where it goes! Have any questions about the GE Kitchen Hub or other smart appliances? Want to share your experiences? Please leave us a comment below - We'd love to hear from you! Editor's Note: This blog was originally written in January of 2019 and has been completely revamped and updated for accuracy as of the publication date noted above. Whirlpool Connected Appliances - New Features for 2019!